Dr. Kaparo has successfully used her method with clients suffering from chronic pain, stress-related illnesses, trauma, and mood disorders including depression and anxiety. Based on the latest brain research in mindfulness and neuroplasticity, this book introduces self-sensing awareness practices that dispel negative habitual patterns of thought and functioning, realign and elongate your body structure, and transform your relationship to gravity and aging in order to enjoy greater freedom and aliveness. New Release! Volume Two of our Awakening Somatic Intelligence Companion DVD Series is Now Available! You can enjoy these standing, sitting, and walking Somatic Meditations℠ throughout your day. These embodied mindfulness practices from the depths of somatic intelligence integrate how we sense, feel, know, see, speak; how we relate to gravity, space, the ground and others, and how we work and create. The video includes animations to support your learning. These practices will nurture and nourish your healing, happiness and wellbeing. Featured segments include slow motion walking meditation to walking up or down an incline with total ease. As with Volume One, the soundtrack was designed by Robert Irving III (Miles Davis, Sting, Santana) utilizing psychoacoustics to engender states of deep relaxation and extended awareness. These companion DVDs create greater ease in learning the practices from the book—Awakening Somatic Intelligence: The Art & Practice of Embodied Mindfulness. Both DVDs offer detailed animations to vivify and illustrate practices that will support you in decompressing your joints and and elongating your spine, to release stress and tension and allow you to move with ever greater ease and grace. practice a day could transform pain, stress, trauma and aging, would you settle for less? Learn to "gravity surf" on the waves of your breath and discover how effortless the process of healing and self-renewal can be. Enjoy in-depth Somatic Learning practices in the comfort and convenience of your own home, as Dr. Risa Kaparo gently and masterfully guides you step-by-step into ever-deeper states of freedom and aliveness. * Chapter selection allows you to reference specific movements efficiently. Awakening Somatic Intelligence introduces Somatic Learning, an innovative bodymind approach to transformative healing and self-renewal. 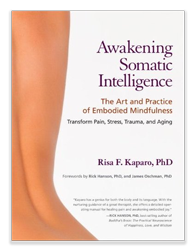 Developed by author, psychotherapist, yoga master, and award-winning poet and songwriter Risa Kaparo, PhD, Somatic Learning teaches embodied mindfulness through breathing, sensing, movement, and touch to revitalize the body’s self-organizing intelligence. Dr. Kaparo has successfully used her method with clients suffering from chronic pain, stress-related illnesses, trauma, and mood disorders including depression and anxiety. Based on the latest brain research in mindfulness and neuroplasticity, this video introduces self-sensing awareness practices that dispel negative habitual patterns of thought and functioning, realign and elongate your body structure, and transform your relationship to gravity and aging in order to enjoy greater freedom and aliveness. Enjoy in-depth, Somatic Learning practices in the comfort and conveinence of your own home, as Dr. Risa Kaparo gently and masterfully guides you step-by-step into ever deeper states of freedom and aliveness. "Awaken is a CD that deliciously invites its audience to enter a space where beauty, sensuality, poetry, and world music are re-interrupted and redefined. It is an album where ancient Hawaiian chants, Jazz, Eastern European Klezmer, and Latin rhythms are all seamlessly interwoven into a new fusion that is both intimate and danceable. Risa Kaparo manages to capture the real feel of a woman’s tongue. She sings, chants, speaks, and caresses the listener into a twenty first century vision of music where spirit and body meet." I want to extend my heartfelt gratitude to the wonderful musicians with whom I had the grace to work: Alex Acuna, percussion; Ernie Adams, percussion; Baligashma Xylophone Group (Uganda); Sophie Barker, vocals; Charlie Bisharat, violin; Eliseo Borrero, bass; Jimmy Branly, cajon; Bridgman, drums; Catto, keyboard; Vinnie Colaiuta, drums; John Cruz, guitar and vocals; Puna Dawson, Hawaiian chant; Melissa Dittman, vocals; Steve Dubey, trumpet; Richard Fammerée, guitar; Steve Gibons, violin; Caroline Glass, accordion; Steve Hashimoto, bass; Jeff Hedberg, flugelhorn; Robert “Baabe” Irving III, piano, keyboards, programming, and choral arrangement; Dolly Kanekuni, vocals; Keyelitsha (S.Africa); Larry Klein, bass; Iki Levy, percussion; Isha Molinea Lewis, vocals; Bob Long, piano; Diane Madison, vocals; Pete McNeil, drums; Paula Miller, vocals; Mustapha Tettey Addy Drummers (Ghana); Omashar, keyboards; Adero Neely, vocals; Jose Prieto, vocals; Mike Rowe, keyboards; David Ricketts, drums, e-bow, keyboards, piano; Cameron Stone, cello; Strunz & Farah, acoustic guitars; David Tickle, keyboards, drums, bass, programming; Tracey Urchal, vocals; Dave Wilder, bass; Peter Woods, guitar. The wonderful friends without whose support this work would never have seen fruition: Ralph Adamson, Larry Boucher, Charles Davis, Cathy Dreyfuss, Kelly Fidei, Richard Garcia, Joan Giguerre, Ray Grasse, Rory Kaplan, Jennifer Kutler, Emigdio Marabotto, Martin Mazzanti, Trevor Mitchell, Bram Morris, Holly Near, Craig Parks, Lisa Rafel, Rhiannon, Lennie Rose, Rob Ruccia, Gail Shafarman, David Surrenda, Judith Wiker, Ellen Wolf, and so many more dear ones who I hold in my heart with gratefulness…you know who you are. here to add text.